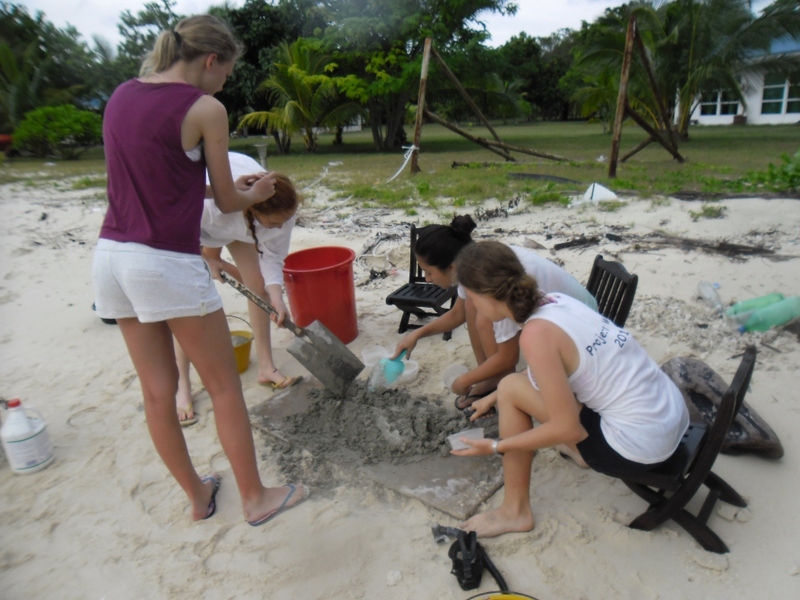 TRACC Borneo Volunteers: Coral planting or how to use cement! 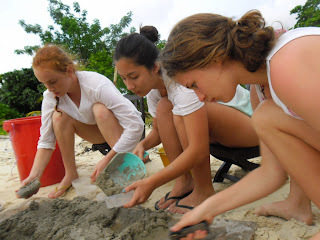 Coral planting or how to use cement! 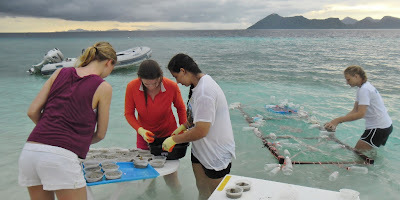 Coral planting is actually quite a difficult and tiring thing to do, we soon realised this once we started the process. We were all reasonably confused when we were instructed to get the cement and start mixing. With none of us having any real experience with cement, and all thought we would just use a machine to mix it, it took a little while to make the first batch. Steve had to start off the mixing and then tried to show us what we had to do. With more experience you could definitely tell the difference between each mass of cement that was produced. There as obviously a difference in the speed at which the cement as produced...we were a lot slower and less efficient then he had been and were quite amazed at how Steve was able to do it so fast. There were however, definitely some of us which were more skilled at cement mixing. Although a gift, it could easily be said as a curse as the job of making the cement was more often than not, bestowed upon Nai. Some may laugh but cement making is arguably an art, four shovels of sand, a bucket of both cement and water added at different intervals should make the perfect cement... most of the time. There were a few dogdy batches where we recieved some complaints about the consistency of the cement or the amount being produced. But all in all I think we actually gained some skill in the end. This demonstration also involved a slight hilarity involving Steve and rather unfortunate decision, after deciding to take a rest on a small, yellow bucket like the top instructor he is, the seat he chose was unfortunately not a wise one. Immediately after he sat down, the bucket then folded in on itself and he proceeded to fall over into the sand. We sat in silence for a few seconds half stunned and half not sure if it was okay to laugh at your supervisor falling over. Looking subtly at each other trying to contain the laughter, he then came out with a joke so we soon realised that he wouldn't mind if we cracked up with laughter. It was definitely the highlight of the task. Forget about planting the coral and the good that does, watching your supervisor falling off a yellow bucket after crushing it is absolutely hilarious! Obviously we were paying full attention to the task at hand, but it was nice to have bit of break and a giggle. 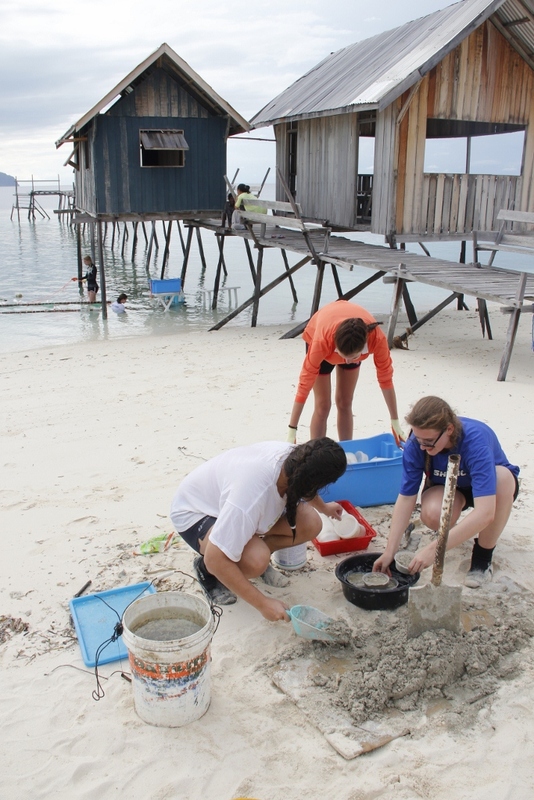 Whilst we were struggling to mix cement, the other half of the group was down in the water actually putting the coral into the pots of cement. I didn't really know what they were upto until I tried it, Steve made us swap over because it had seemed to turn out that each time the same groups were doing the same thing. Only then did I realised how difficult both tasks were, trying to keep the productive line and placing coral in cement is actually harder than it seems. There also seemed to be a lot of mucus from the coral...something which I did not expect. I was a little surprised when my gloves became soaked with the mucus the coral secreted. However cement mixing was definitely my preferred job rather than planting, I suppose I just don't have the talent for planting. It was also much nicer sitting on the beach in the sun rather then being a little chilly in the water. We have to admit that we did get pretty good at, we gained a bit of strength from not only using the shovel, but also from carrying all the buckets of cement and water back and forth...as well as the mixing board. We figured out by the third time we were mixing cement, that if three of us went to get the water we could carry two buckets between us and it was A LOT easier then trying to haul the buckets by ourself. At the end of the first day of mixing, the team we had, seemed to disperse all of a sudden, leaving the best one of us (Nai) and me to make the last few bits of cement. Unfortunately from all the hard work Nai started to feel a little ill...so she took a nap under the sun...I was left to scoop the cement into little pots by myself. Luckily for me there was only a small amount of cement left so it wasn't too hard. Plus on the bright side I realised that once you start and continue doing the same thing for about half an hour, you get into a pretty good rhythm. 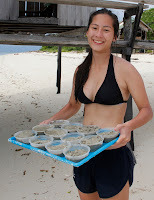 After 6 days of working and working, we were able to make and plant around 1800 pots of coral. I think that's a pretty good achievement and i'm glad it all seemed to work out in the end. After the little glitch of realising that swapping the groups over wasn't the best idea, and that we should stick to what we are good at, we were able to achieve our goals for coral planting.